Certified Home Services can solve your rodent control problem with a discreet, safe and effective rat or mice control treatment. Having mice (mouse) or rats in your home is not a reflection on persons hygiene. They will go into any dwelling they can get access to looking for food or shelter. The problem is once they have found a suitable environment they will nest and reproduce. So once you see activity you need to act fast with professional Rodent Control! Rodents can be an issue in around your house because of their flexible skeleton. This gives them the amazing ability to squeeze into any gap they can fit their head through. Rats and Mice are problematic in our homes mainly due to the wide range of diseases then can be carrying. We don't have to go into great detail on the types of diseases they carry, just know that they are very nasty, especially to those who suffer from asthma and allergies. Also apart from Termites, rodents are one of the most destructive pests for homes. Mice and Rats will happily gnaw though anything in their way to get to food or water. This has lead to electrical fires where rodents have chewed through electrical wiring. 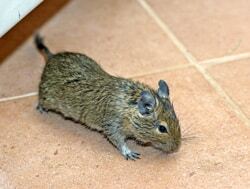 An experienced Pest Controller will have the knowledge of certain characteristics mice and rats have. This will lead to effective Rodent Control. Firstly effective rodent control starts with an inspection to known hotspots looking for signs of nesting and activity. Our Pest Controller will inform you if they see any entry points. To keep rodents away for the long term these will need to be filled in, AFTER the successful treatment has taken place. We also offer a rodent proofing service if you don't want to do it yourself. Using the results from the inspection we then decide on the best treatment method being baiting, traps or a mixture of both. It is important not to close up any access holes as the bait is designed to dehydrate the rodent so they leave the dwelling in search for water. The idea behind this is to stop them dying in the walls or hard to reach areas of your home. But be aware this does happen sometimes and you might have to go and find the dead rodent and dispose of it. If you can't do this we also offer a removal service . In the time we have done pest control this has only happened twice so it is pretty rare. The rodent control bait boxes are a locked, tamper proof, hardened plastic black container. The stations are placed in discreet locations around the home which include the ceiling space, subfloor and sometimes sheds and garages. For a baiting treatment to be successful there needs to be no other food sources present. This includes pet food left outside the house. We can enhance the baiting system by putting an attractant in the enclosed bait box. It is important the customer doesn't move the boxes around themselves. You will leave a scent on the rodent bait box which they will smell and then avoid. There may be a little lead time needed for the baiting to take effect. At first the mice and rats will be cautious of these new foreign boxes put in their environment. Once they trust there is no threat they will become more inquisitive and explore what the box has to offer. The baiting boxes remain the property of Certified Home Services and are used as part the rodent treatment. The boxes are not left in permanently as the bait will start to attract cockroaches and evolve into a much bigger problem. We have discreet baiting boxes for commercial premises and also high end electronic systems which destroy and capture rodents. These electronic systems are perfect for the customer centric businesses where their business name and reputation come down cleanliness (Hotels, Resorts & Restaurants). The system doesn't bait with the risk of the rodent dying around the business. It is an all in one system that euthanizes the rodent via electric shock and moves it into a plastic bag which is then heat sealed closed. It can hold a large numbers of mice or rats before it sends off a text message for us to come out and refresh it. Droppings - A common way to know if you have mice or rats around your place is by their droppings or stool. 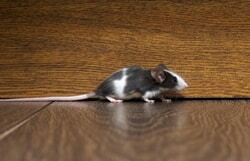 Mouse droppings are normally around 4mm in length and rat droppings are much larger being around 10mm. So there is quite a sizeable difference between the two. Also you can tell if it's recent activity if the droppings are soft and shiny. Hard droppings indicate they have been laid more than 3 days ago. Also people think they have mice or rats and it actually turns out to be gecko droppings which you can identify by the white tip at the end of the dropping. Smell - Rodents nested in the one area for a decent amount of time will build up a foul smell mainly from their stale urine. Their stool once dry is not as potent as it's urine. Gnawing - More so Rats than Mice, need to keep their teeth sharp and to a certain size. They have four long sharp teeth, two on the top and another two on the bottom. The top two hold and stabilize items and the bottom two do the pulverising. They can gnaw through most building material which includes brickwork. Gnawing is something rats do to keep the size of their teeth in check. Sounds - At night when it gets quiet you can often hearing mice or rats in the walls or ceiling space. Their squeaking and scratching can be quiet loud especially in the still of the night. In fact a lot of the time people actually think they have possums as they sound very loud in the ceiling and it usually turns out to be rats. Also on a couple of occasions some people think they have mice in the walls and it has turned out to be Termites. The rule of thumb is if you think you have rats in the ceiling its mice . And if you think you have a possum it's generally rats. And if you will definitely know when you have possums because it sounds like someone's having a party up in your ceiling and they will fight during their nesting season and they will keep you awake all night. Smear marks - Common paths will have smear marks up against walls and corners. Rodents have oiling fur and will mark surfaces over time. Keep note of these areas to inform the Pest Controller. These might be key indicators that a nest is close by. Fur tufts - Fur stuck to brickwork, timber or around tight cracks is also a good indicator or high traffic areas. When there are no more signs of rats or mice you need to seal up the entry points. This will make it hard for rats to get back in. Holes and Burrows - Commonly found around brickwork, rodents will dig their way through or around any obstruction to find a suitable nesting place away from the environment and predators. Nesting . Their ideal location for a nest is in the ceiling space and generally made out of insulation and any rubbish they find around the home. Occasionally we have found nests in lounges and linen cupboards. Rats and mice infestations happen more often in autumn leading up to winter. They like us don't like the cold of winter so they go in search of a nice warm place . Also it is good to remember if you see one rat or mouse it is not one you will have quite a few. Also spring is a high time for them to invade your home as it is their main time of year for breeding and they need a safe place to nest . So if you see rat or mice activity around your place it's best to act fast. Apart from spreading diseases they can really do physical damage to your property. and they can multiply very quickly. Give Vicki or Lauren a call to organise a Rodent Control Treatment on 1800 862 683. They will be happy to talk you through the whole process .or just fill out the fast quote form and we will contact you. We get rid of mice and Rats in Brisbane , gold Coast , Logan and Ipswich . Other Pest Control Services .